Day Five: In the morning Barbara and I enjoyed just driving together in our Prius. 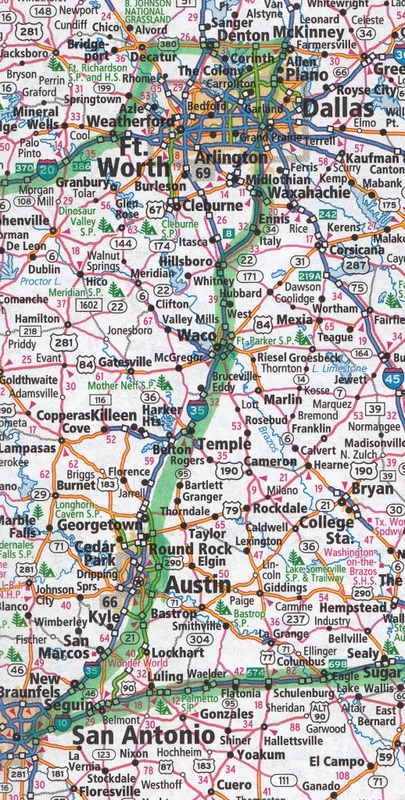 Today's plan was to drive from Duncanville (near Grand Prairie on the map) to Austin for a lunch with Barbara's cousin, Ann. Later we would travel to San Antonio to take in the River Walk and the Alamo. What a relief not to deal with a 26 foot diesel truck for another day, but we still had to face road hazards like the rock that poked a hole in the windshield as we passed trough Temple. We called Barbara’s cousin Ann as we neared Austin on Highway 35. By noon we found our way to the Country Line BBQ. The view of the Colorado River and the bluffs around Austin was almost as good as the Texas barbecue ribs. We shared our binder of pictures about Barbara’s mom, Ruth LaPlante, and all the LaPlante and Yeoman families. After hugs and good-byes we made a beeline to San Antonio. ...murals, buildings, and the Tower of the Americas from the 1968 World's Fair. It was a great ride for people-watching and enjoying new vistas at every turn. The Alamo was only a short walk away, although it seemed longer in the heat and humidity. A free documentary movie gave a great overview of the famous battle (in sharp relief from the John Wayne classic) in air-conditioned comfort. A beer and a few tacos with a view of the River Walk finished our San Antonio experience. What a way to kick off our free-wheeling tour of the southwest.